Panchayat Raj and IT Minister Nara Lokesh has said that there are high of chances of cyber attacks due to utilisation of advanced technologies, including cyber security system. The situation has turned a huge challenge to the entire software industry. Software companies must focus on the issue and evolve a suitable solution for the problem. Addressing the ‘Andhra Pradesh Cyber Security Summit – 2018’ here on Friday, the minister spoke about State government’s initiatives for the welfare of people using advanced technologies. He also explained about the new IT policy initiatives including recent agreements with several start-up companies as well as global companies like Master Card, Franklin Templeton, Conduent etc. in the fields like FinTech, cyber security, real time governance (RTG), e-cabinet, blockchain technology and use of IoTs as well as collect information on water quality and delivery, quality of roads, Ease of Doing Business (EoDB), to help the agriculture sector achieve 24 per cent growth by using the data analytics. He also emphasised upon the importance of cyber security practices and State initiatives including APCSOC – India’s first cyber security operations centre. ‘We are planning to enhance capacity building process in cyber security system to increase employment opportunities for youth in the future. The latest agreements with global companies like Franklin Templeton and Canduent will generate a number of employment opportunities for our young software engineers. The state had lost all mobile phone manufacturing companies due to bifurcation, but now we have achieved the top position in mobile phone manufacturing sector as every two mobile phones out of 10 produced in the country are from Andhra Pradesh. Similarly, we also occupy the first place in ‘Ease of Doing Business’ sector. 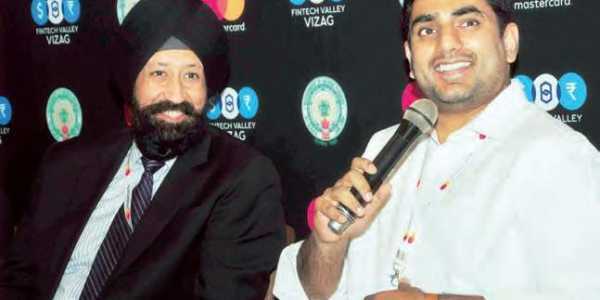 With the conditions being so favourable we have invited many more Global IT companies to invest in our state and the results are very promising,” Lokesh said. The minister said that though there are some differences between the Union and State governments, IT sector in the State has registered progress. “Our mentor, guide and ambassador is Chief Minister Chandrababu Naidu and we need not bother about the support of the Central Government. But now the situation is not bad,” Lokesh said. Speaking at the summit, JA Chowdary, AP state IT wing Advisor said that there would be a huge demand for security experts to protect the key data of banking and finance sectors from cyber attacks. AP is the only State conducting ‘Cyberthan’ competitions for young techies in ethical hacking, cyber security etc. he said. Vijayanand, Principal Secretary for IT, explained about the salient features of IT Policy and said that the State government is moving ahead with advanced technologies for its start-ups and cyber security policies. The Government is planning to provide training for youth in cyber security which will provide good job opportunities to them, he added. Ravi Arora, executive director- Master Card company said that in the coming future cyber attacks may affect individuals and institutions and if unaddressed, it is going to hamper national economy as well. Master Card was designed in such a way to protect the secrecy and privacy of every individual payments as well as periodical transactions history, he explained. The digital technology used in the Master Card and protective protocol systems are very much useful in protecting all types of financial transactions of customers in full confidential manner, he said. Around 450 representatives from several foreign countries and educational institutions and cyber security experts including APITA CEO Tirumala Rao attended. Later, Minister Lokesh distributed the prizes to the winners of ‘cyber hackathan’ conducted by APITA. Minister Lokesh also visited Brandix- India apparel city situated at Atchyutapuram village and interacted with the employees.